Last year, my friend Jess and I decided to spend the (very sunny) day of the Olivier Awards down in Covent Garden enjoying the live performances from many nominated shows and then watching the full screening of the awards on the big screens in the evening which is the only place you can watch the awards in full (more on that later). It was one of the most magical nights of theatre I can think of ever having: it was the first time I could experience this. My friends weren't allowed to go to London unaccompanied the year before and I couldn't imagine any parents wanting to accompany us, and there was something just so special about being able to enjoy a blend of the fantastic theatre I constantly surround myself with on a warm evening and the company of a friend who shares my passion. 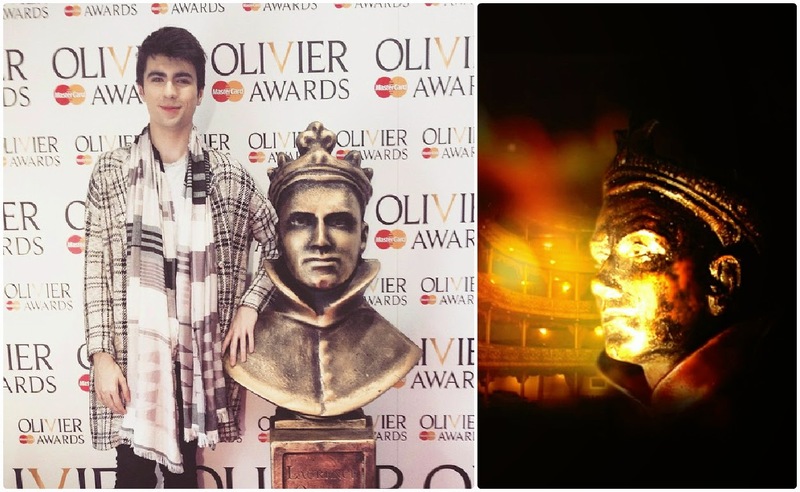 Unfortunately, we couldn't do that again this year due to prior commitments so I decided I'd view the Olivier's like the majority of the country: through the internet and through the telly. Let's talk about how I had to resort to watching the Olivier's first. It's a massive shame to have to find out the results through the world of Twitter and then listen to people tweet about the amazing live performances and moving acceptance speeches when there really is no way of watching the awards in real time. Regardless, I persevered and thought that the highlights on TV would show me the vast majority of what I wanted to see from the awards themselves... Nope! The only performances that were televised were ones from Beautiful, Memphis, Sunny Afternoon, Nicole Scherzinger from Cats, Miss Saigon (which was a very random "look who you didn't nominate" performance from Eva Noblezada who was most definitely snubbed of a nom), Julian Ovenden and then Kevin Spacey at the very end with Beverley Knight. Major performances from Best Musical and Best Musical Revival nominees like Here Lies Love and City of Angels (two of the top three best shows I saw in 2014) didn't get their performances televised, which is especially strange for CoA considering they went on to win Best Musical Revival... oh wait, they didn't even televise their acceptance speech either!? Nope. The only major awards for musicals that were televised were Best Actress in a Musical (presented to Katie Brayben for her performance of Carole King in Beautiful) and Best New Musical to Sunny Afternoon. All of the other major acting awards for musicals were added on as little snippets at the very end of the programme as well as the award for Best Musical Revival. Plays were also snubbed of a heck of a lot of screen time as well. Clips were shown of the Best New Play nominees at the actual ceremony according to people who were there but that wasn't even mentioned in the ITV highlights. Instead, they televised the winners of Best Actor, Best Actress, Best Revival and Best New Play in full which I'm assuming took up most of their screen time. The weirdest part for me though was that they also brushed over stage and screen legend Angela Lansbury's Olivier win this year considering this was her first Olivier and the audience at the Royal Opera House were at their most passionate! (It's important to note that Lansbury has never won an award because she hasn't been on the West End in 40 years and the Olivier's were first presented 39 years ago so it would have been impossible for her to have ever won before; it's not because she's been beaten on several different occasions or something). I just think that it's time the Olivier's were treated in the way that the Tony's are in America - full coverage is broadcast live across America on CBS, one of America's leading TV channels. Instead, we are stuck with "extended highlights" that are primarily focused on weirdly out of place performances from the biggest musicals (Nicole Scherzinger especially was a very out of place performance - they didn't even put her in a costume!). As for the actual award winning, I'd be lying if I said I wasn't surprised by the outcome. If you follow me on Twitter then you're sure to have seen my predictions that I tweeted out beforehand. I'm truly shocked that Nicole Scherzinger was beaten to Best Actress in a Supporting Role in a Musical by Beautiful's Lorna Want. I've personally seen both perform in their respective shows and though Lorna was incredibly talented too, I most definitely think that Scherzinger's performance was a lot more award worthy than Lorna's which is a shame. I also cannot believe that Best Actor in a Musical and Best Actor in a Supporting Role in a Musical went to two of the stars of Sunny Afternoon. I actually don't disagree that Best Actor in a Musical could have gone to John Dagleish because his acceptance speech even told me that he was pretty well suited for his part, but I find it hard to believe that two of the main four leads from the show were worthy of the two main acting awards in a musical for the men but hey ho... I also feel incredibly surprised that Sunny Afternoon went on to win Best Musical. I guess I can't really comment because I'm yet to see the show but I find it so odd when proper jukebox musicals win such prestigious awards; it only furthers my dislike for the genre. If I were to have it my way, Made in Dagenham would have been nominated and won that award for sure. Actually, make that Made in Dagenham would have been nominated for many awards and would have won most of them for sure - that show is the most snubbed show I have ever seen. I also don't think Lenny Henry was all too good or relevant as the presenter of the evening to be honest, but I did like seeing so many different stage and screen legends presenting the awards this year. The Olivier's are truly a night to celebrate the world of fantastic British theatre (and all of the theatre in London too considering even off-West End shows can clearly be nominated and win in major categories: City of Angels, for example). I just wish that people who don't have the ability to spend the evening sat on the cobbles in Covent Garden could experience the entire ceremony in all of its glory, and in all of the glory that it deserves to be held in.